Execution is the essence of business agility. An agile business needs to move rapidly to capitalize on business trends. However, a business move intended to be agile will most likely fail if it is executed too slowly. Barriers to agile execution abound, though IT infrastructure is frequently a root cause of this unfortunate outcome. There are no easy fixes. However, virtualization is now able to offer managers the ability to execute the quick deployment and scaling of IT systems that can support agile business initiatives. That said, not all virtualization technologies have the same capacity to impact truly cost effective, agile businesses. Many factors influence the outcomes of decisions aimed at increasing business agility. People are a significant factor, but information technology is usually the primary element affecting the results of an agile business move. Success with IT is crucial for the realization of an operational change intended to affect an agile strategy. In this regard, developments in virtualization can offer business managers powerful new tools to make agile moves that can be executed quickly, economically, and inexpensively. 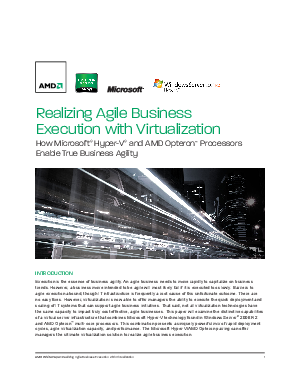 Download this whitepaper to learn more about agile business execution with Virtualization.